10″ x 96″ Shelf Only. End caps sold separately. Request to cut custom lengths are welcome. Extruded from strong, lightweight thermoplastic, the shelves are incredibly strong, do not require paint or finishing and are simple to keep clean. The 10″ shelf is reversible. On one side it’s a shelf; flip it over and it becomes a tray with a 1/4″ lip, great for keeping things in place. Shelves can be cut to custom lengths using conventional woodworking tools. The shelves can be used with and without End caps. End caps sold separately. SKU: SW-SH-10. 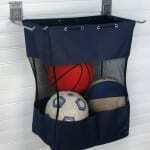 Categories: storeWALL Wall System, Baskets & Shelves, Shelves.